People had queued for up to two hours to try to secure an appointment to apply for a driving licence before the centre closed. SECURITY HAD TO be called to a National Driver Licence Service centre in Dublin last week after people refused to leave when it was closing. A group of people who had been queuing for an appointment at the NDLS centre in Santry refused to leave on Thursday evening last at 5pm after staff said that the centre was closed for the day. People had been waiting in a queue for up to two hours to try to secure an appointment to apply for a driving licence. The last call for appointments was 4.50pm. Anyone who had not managed to secure an appointment by that time was told they would not be seen by an official and was asked to leave. About 8-10 people refused to leave the centre at this time, expressing frustration that they had been waiting for a long time and criticising the appointment process at the centre. Some of those present said their licences had expired and that they needed to renew them as a matter of urgency, while others were there to apply for first time learner’s permits or full licences. An argument ensued between a number of people and a staff member, before security was called. Two security men arrived quickly and an argument continued between those present. After about 25 minutes, all people left and staff shuttered the centre. Anyone who want to apply for a new driving licence or learner’s permit or renew an old one must present at an NDLS centre to supply the required documents and have an appointment with an RSA official. There are four NDLS centres across Dublin, which open from 9am to 5pm Monday to Friday and from 9am to 2pm on Saturdays. People can book an appointment online for a set time or can arrive at the centre where they can book an appointment through a number system, and wait to be seen. Appointments can vary in length from a few minutes to longer depending on the service required and if the person has the appropriate documentation. There are currently no options to book appointments at three of the four Dublin centres, while the next available date in Santry is Wednesday 25 April. Staff present in the Santry centre on Thursday evening said that the service had been busier the past three weeks. A spokesperson for the Road Safety Authority – which is responsible for managing the NDLS centres – confirmed to TheJournal.ie that there has been a significant increase in demand for driving licences recently. During the month of March this year, applications for licences were up by over 30% on the same period last year. “This level of increased demand has brought challenges for NDLS centres,” the spokesperson said. Capacity levels are continually being reviewed at the NDLS centres but increases of the scale experienced recently is unprecedented. People who arrive at the centre without an online appointment are usually required to enter their name into a computer number after which they are given a number and a place in the queue. The RSA spokesperson said that in most cases up to 50% of application slots are provided through the booking system with the public and the remainder available for walk-in customers. “We are reviewing the booking system to ensure we get the correct mix of booking and walk-in slots for each NDLS Front Office,” the said. In Santry on Thursday there was a group of about 20-25 people waiting to receive a numbered appointment at 3.40pm. The one staff member present told people at this that they were not guaranteed to get an appointment. 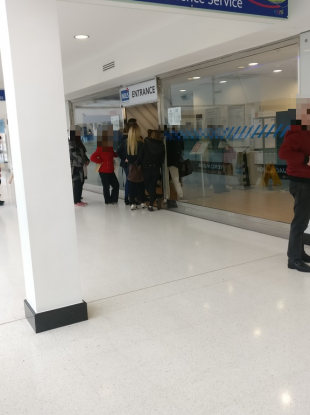 While there are seats in the main waiting area, those waiting to receive a number had no seats and had to queue out the door of the centre – this despite there being seats available in the other area. By 4.30pm, there were about 13 people waiting to receive an appointment, with the service closing at 4.50pm. One man who had waited over two hours on Thursday and the previous day without getting an appointment expressed frustration at what had happened. “The entire process is a complete shambles,” he said. “Leaving people waiting. There were 60-year-old men and women that had to stand there for hours. There wasn’t any seats in there for people who are queuing up. People who have appointments they go in and sit down but what about everyone else… There are people who can’t drive their cars, that affects their whole life. The RSA spokesperson told TheJournal.ie that some of the increased demand is related to announcements of changes to identity requirements which now gives the option to bring the Public Services Card (PSC) to the NDLS from today. In late February, the Road Safety Authority (RSA) stated that, from 9 April, all applicants for a licence would have to first obtain a PSC. However, the RSA stated last month that having a PSC when applying for a licence would be optional. The spokesperson also said that that the RSA would be rolling out an online services for some customers at the end of May. “We have reviewed the Online booking system and apart from some slowness due to the increase in applications there was no evidence of errors on the booking system, we will continue to monitor this,” the spokesperson said. Email “Security called after people refuse to leave Dublin driving licence centre without getting an appointment”. Feedback on “Security called after people refuse to leave Dublin driving licence centre without getting an appointment”.